You control your life, live the life you want! There has been a paused to my blogpost as I was really busy attending classes, studying and taking exams. However, those are not relating to ICAEW. I believed that I have told you of my changing of plan long before I went to volunteer in Japan. Chance arrived shortly after I came back from Japan and I immediately grab hold of the chance to fulfill my childhood dream of being a cabin crew! And now I'm residing in another country to fulfill this dream of mine. So, what about the course that I took? To update you that read my posts because of info on ICAEW, I truly am sorry for quitting halfway (though not officially, as I am still paying for ICAEW's annual student fee and have not sent in any documents to stop all my study altogether), and I have no plan to continue it, not at this moment. 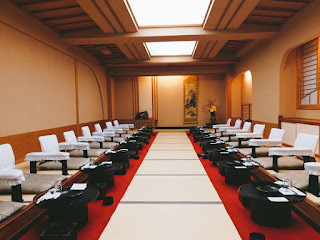 Ryoutei is a luxurious traditional Japanese restaurant, which served kaiseki style meals for business and formal meetings (source from Wikipedia). Everyone that goes to a Ryoutei has a purpose. It is not just a simple filling the stomach meal. It can be a business meeting, a celebration, a family meeting, a book sharing session, a reunion, a party or any occasion you can think of, which is why the customers going there are usually dressed formally. 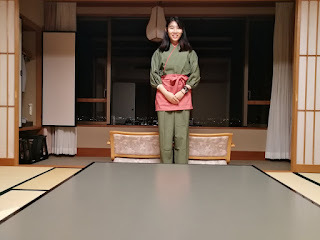 Having said that, anyone are welcomed to visit a ryoutei to enjoy the exquisite, delicate meal prepared by a qualified chef and served by the beautiful omotenashi-san (something like waitress?). However, do remember to make a reservation in advance as meals are prepared freshly according to the number of customers. Very common terms but the most polite terms. These 2 terms accompanied me during my whole internship period. If you do not know, I internship-ed in Japan for 2 months in the service industry. To know how I came across this internship opportunity, click here. The ryokans, aka Japanese-styled hotel, that I worked in were Takimotokan Yukinosato (滝元館遊季の里) and Umi no Hana (海の花). They are luxury ryokans strategically located closed to tourist attractions, which provide great hospitality and ultimate relaxation to the guests. 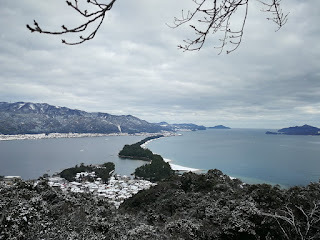 Both are ryokans with private and public onsen. Since the main topic today is my internship experience, I'm not going deep into information of both the ryokans today. I will be writing more information on both the ryokans and the surrounding attractions in another post, or if you can't wait for it, please visit their website! Hi! Happy Chinese New Year!! Continuing from the previous post. We woke up early for breakfast at the Hong Kong-ians' favourite DIM SUM! 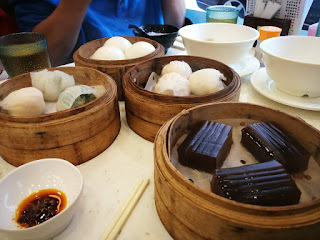 We went to a dim sum restaurant near our hotel and ordered about 12 items as my sister and I were starving (planned to stuff as much as we could as we knew that the food in Disneyland would cost twice as much as the usual food price). We thought that 12 items were quite the normal amount until the waitress turned around and confirmed with us the amount of food that we ordered. Were 12 items too much for 4 people? These are some of the items that we ordered. If you are not sure what to order, try order the items that are marked with a star. Those are the recommended items. Contact me! Reply within 24hrs!